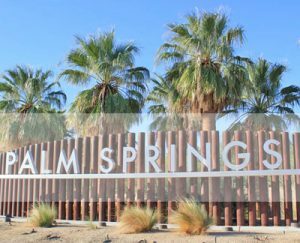 Location: Palm Springs, California lies on the western edge of the Coachella Valley, within the Colorado Desert. Located approximately 110 miles southeast of Los Angeles and 140 miles northeast of San Diego, it’s an easy two hour drive. The permanent year-round population is about 45,000, and doubles during the winter season.